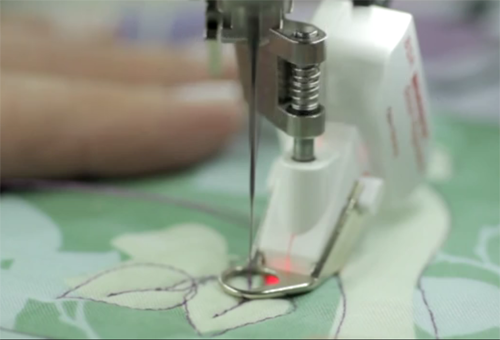 Many of you know about the BERNINA Stitch Regulator (a.k.a. BSR), a very clever presser foot with a laser “eye” that reads the movement of the fabric as it passes under the foot. When the BSR is activated you can see the red light shining on the fabric, just behind the opening in the sole. I’ve been free-motion quilting for quite a while, but it’s nice to have the BSR handy for when I’m out of practice and need more than just a short warm-up. (Sadly, my free-motion skills aren’t what they used to be.) This accessory helps even out my stitches, compensating for my inconsistent – too fast, too slow, oops! too jerky – movement of my project. Here’s a short video about the BERNINA Stitch Regulator, including tips on the differences between Modes 1 and 2. Enjoy! How can you love any other machine???!! Really!! PS I almost forgot, who did the music clip for this??? I LOVE IT TOO!! !